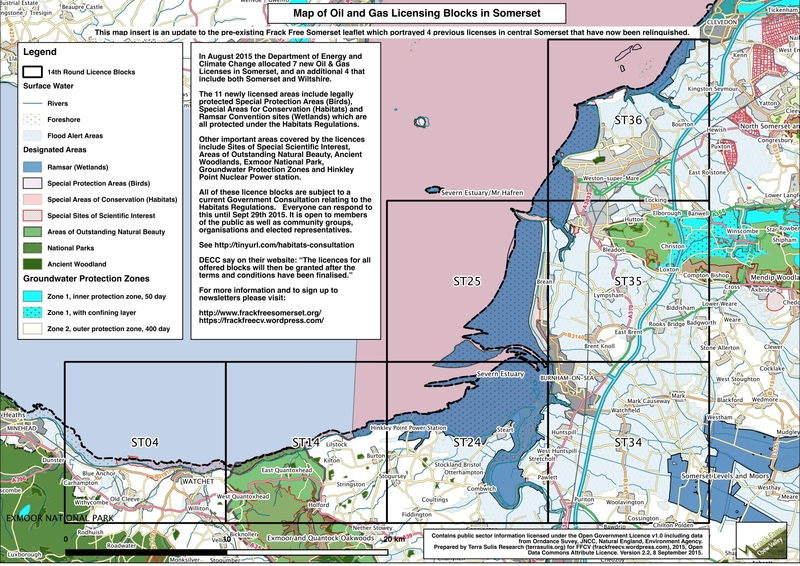 NB: There are fracking licences in and around Bleadon (click on map above and read PEDL320). Key PEDL dates. and licence holders (see highlighted page 4). Also, 14th Onshore Licence Round map and national and well & seismic maps. If Britain, i.e. parish, town & district councils and central government, has commitments to reduce the use of fossil fuels and reduce CO2 emissions, how does local fracking meet that objective? How does fracking fit in with local parish & town Neighbourhood Development Plans? The (former) Frack Free North Somerset (FFNS) website has posted that on Friday 2 December 2016 the CEO of South Western Energy Ltd spoke on BBC Bristol indicating the "desire to drill ‘just south of Weston-super-Mare’ and to build a ‘small modular power station’ to convert any shale gas into electricity". Rachel Stevens of Frack Free EQS spoke on BBC Somerset with the site indicating "We were told to expect planning permission submissions within the year, and drilling with two years, it is now particularly important that we quickly develop the skills and capacity to watch planning permissions coming in to Somerset & North Somerset councils". The FFNS site includes links to these two podcasts. Other council information is listed below. 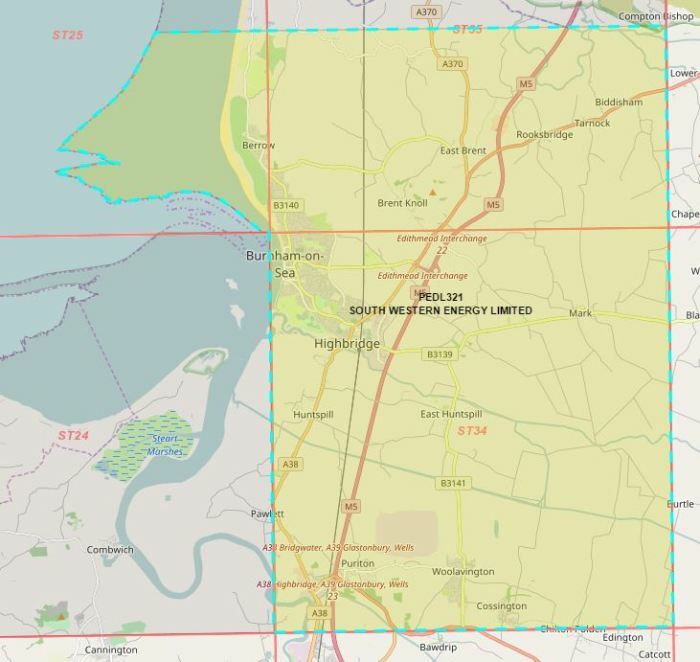 To check whether you are in a potential fracking area enter your postcode at the Oil & Gas Authority website, click on the map then the arrow keys to read the two pages of associated information. The Oil and Gas Authority’s role is to regulate, influence and promote the UK oil and gas industry in order to achieve our statutory principal objective of maximising the economic recovery of the UK’s oil and gas resources. Bleadon's Petroleum Exploration and Development Licence is PEDL320 (map on page 38 of PEDL document, clearer 320 map here). Neighbouring PEDLs include PEDL321 (321 map) and PEDL344 (344 map). A map of all licences in the area can be seen here. NB: It is indicated that all Neighbourhood Development Plans will need to comply with the NPPF (directly or indirectly), see policy heirarchy diagram. UPDATE 26 JULY 2018: Friends of the Earth state, "The National Planning Policy Framework, which was released on the very last day of parliament (24 July), promotes fracking ... Friends of the Earth is concerned that ... By requiring planning authorities to plan positively for shale extraction, the approach gives the go-ahead for fracking and will make it virtually impossible for councils to refuse schemes they and their communities do not want or consider right for their area"
UPDATE 24 JULY 2018: Sum of Us create a petition stating, "Secretary Greg Clarke has just announced plans to fast track planning applications for fracking developments ... they'd not need planning permission at all. Local councils would also lose any right to have their say in the matter." Reference: Revised National Planning Policy Framework (NPPF) 24 July 2018 e.g. Section 17 Facilitating the sustainable use of minerals, page 58 (mineral extraction) and Section 14. Meeting the challenge of climate change, flooding and coastal change. Also, see BOB Revised Planning Policy blog. How did North Somerset Council and/or Bleadon Parish Council respond to this public consultation? 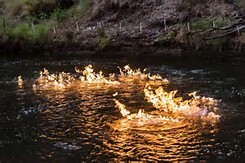 Light Your Water on Fire from gas drilling, fracking. A video by Scott Cannon DEP consent order proving methane migration. A newspaper states "An Australian MP has set fire to a river in Queensland in an attempt to draw attention to the effects of local fracking, which he claims is causing methane gas to seep into the water"
An EcoWatch article and Dryden Community Action Video showing how residents said NO! to developers and how Marie McRae, a country resident in the US, galvanized the community to support a ban. 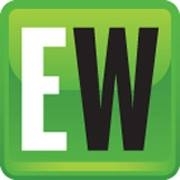 "EcoWatch is one of the nation's leading environmental news sites engaging millions of readers every month. We are at the forefront of uniting all shades of green to ensure the health and longevity of our planet. EcoWatch is leading the charge in using online news to drive fundamental change." You can watch fracking effects & damage videos on the Groundswellrising website, created to 'protecting our children's air and water'. WSM No Fracking Petition A petition by Lucy Sparks to North Somerset Council and The Environment Agency regarding No Fracking in Weston-super-Mare and Surrorunding Areas. Asking them to refuse planning permission or environmental permits for planned fracking operations in Weston-super-Mare and Surrounding Areas. FOE national petition " The government needs to listen to the people. Support for fracking in the UK is at an all-time low. Despite the government backing fracking wherever it is proposed, people and communities object to it.... Ask the government to listen to people and ban fracking now. To: Prime Minister Theresa May. Fracking poses unacceptable risks to people, the climate and the environment. Please implement an immediate ban on fracking." 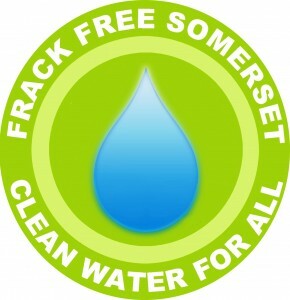 Frack Free Somerset is a coalition of groups taking action on unconventional gas development. They are a diverse network of local people, from farmers to families, willing to take action together for clean water for all. Gas Field Free Mendip are "are a diverse network of local people, including councillors, farmers, families, geologists and other professionals, who live and work on the Mendips. We are willing to take action together to draw peoples’ attention to the damage that Coal Bed Methane and Fracking for Shale Gas may bring if forced upon local people. We believe that these unconventional gas exploration methods are not compatible with the Mendip environment and that there is risk of serious adverse impacts on this and future generations. Rachel Stevens of Frack Free EQS spoke on BBC Somerset on 2 December 2016 regarding the recent announcement on fracking just south of WSM. The site states that "We were told to expect planning permission submissions within the year, and drilling with two years, it is now particularly important that we quickly develop the skills and capacity to watch planning permissions coming in to Somerset & North Somerset councils" You can listen to the podcast on the Frack Free North Somerset website. 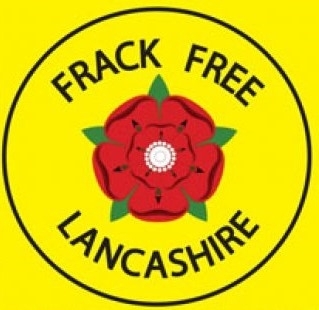 Facebook, "Frack Free Lancashire (FFL) is part of an expanding national movement that opposes the development and extraction of shale gas worldwide. Our mission is to protect our environment for our children and for future generations. Taking action now will safeguard the health and wellbeing of our communities from the effects of air pollution, water contamination, seismic movement and toxic & radioactive waste." See also their website page. "Drill Or Drop.com, publisher of independent, evidence-based journalism about the onshore oil and gas business in the UK and the campaign against it ... We ask whether the UK should drill – “go all out for shale” (and other sources of hydrocarbons) for their benefits to the economy and energy independence. Or should we drop the idea because it carries too great a risk to climate change, environmental damage, human rights and an industrialised countryside." The topic of fracking in Weston-super-Mare has been taken up by Streetlife here and here. Streetlife is a British social network for local communities. We have a simple aim: to help people make the most of where they live by connecting with their neighbours and sharing practical information, advice and resources. UPDATE 11 FEB 19 - Extracts from Drill or Drop article entitled "Senior officials failed to give clear answers on decommissioning of fracking wells – MP", also includes online comments. "... what would happen if shale gas companies went out of business before land had been restored ... the questions had still not been answered, many years after the start of attempts to frack. ... Whatever one’s thoughts on the fracking industry as a whole, it cannot be right that these questions, which could lumber the country with hundreds of millions, or even billions of pounds of liability, are unanswered now many years into attempts to frack." Campaign to Protect Rural England, CPRE write about Earth tremors, fracking licenses and the Infrastructure Act and explain fracking from their perspective. CPRE campaign for a beautiful and living countryside. We work to protect, promote and enhance our towns and countryside to make them better places to live, work and enjoy, and to ensure the countryside is protected for now and future generations. Friends of the Earth state "We campaign for solutions to environmental problems. We're a member of Friends of the Earth International, which has groups in more than 75 countries including Scotland. We also have a network of more than 200 local groups.". "The government needs to listen to the people. Support for fracking in the UK is at an all-time low. Despite the government backing fracking wherever it is proposed, people and communities object to it." FOE national petition "To: Prime Minister Theresa May. Fracking poses unacceptable risks to people, the climate and the environment. Please implement an immediate ban on fracking." Frack Off the Extreme Engery Action Network have a map showing their known local action groups. 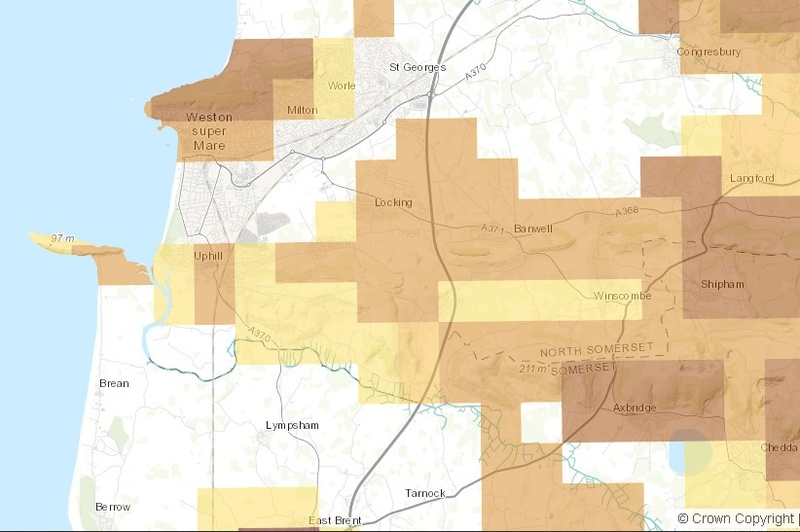 North Somerset Mapping system can be used to check planning policy data e.g. Areas of Outstanding Natural Beauty (AONB), Sites of Special Scientifc Interest (SSSI), Conservation Areas, wildlife protection areas, etc. To see mapping data just enter your postcode, tick the boxes required and click on the map to read the associated information. North Somerset planning policies and their planning applications along with their weekly lists. Sedgemoor District Council's Planning Online is an internet service that allows you: to view details of planning applications that have been or are being considered by the Council, to monitor the progress of an application and to search a weekly list of applications received and decided. West Somerset District Council has a search facility for all planning applications dating back to 1974. Details available include the address, proposal, decision, case officer and applicant details. You will also have the opportunity to view plans and documents for applications from 2010 to date. Also a weekly and monthly lists of details of applications registered or decisions made. Somerset County Council planning applications that relate to minerals, waste and our own County Council developments such as schools, libraries, Social Services developments and new roads. Your local planning authority (District or Borough Council) should be able to advise you of other types of developments, including extensions, residential and business developments. You can search for current planning applications and submit your comments online here. You can also view planning applications that have already been determined. Also their Explore Somerset mapping system. 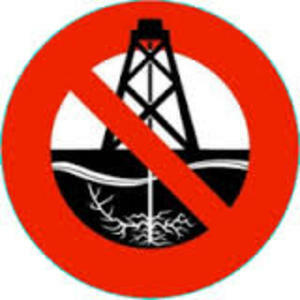 As of Feb 19 Bleadon Parish Council is yet to discuss the fracking issue in a public forum, either main council or NDP Working Group 2017-Date. This is despite being being made aware in Nov 2015 (Min 278.16.12) by FrackFree Somerset, again in Dec 2016 by BOB re: Bleadon Hill Development e.g: the PEDL320 affecting Bleadon that was signed in Sept 2016; in 2017 re: Bleadon's NDP project; in July 2018 re: NPPF Review; in Nov 2018 re: NSC Local Plan 2036, and in Nov 18-Feb 19.re: BPC NDP Survey, Feb 19 FFNS speak at BPC meeting re: fracking and letters sent to Bleadon landowners. "Please can BPC/NSC inform us what is the purpose of the Settlement Boundary and how it relates to development applications? ... What is being done, or can be done, to protect Bleadon Parish's rural and village environments and way of life from repeated development applications, including encroachment into the extremes of the parish now, and for future generations (e.g. 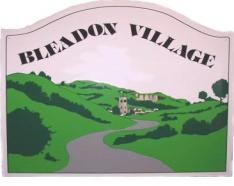 existing and future applications/licences on the Bleadon Levels for dwellings, businesses, solar energy, fracking, etc.)" "Please can BPC/NSC inform us of what is being done, or can be done, to protect our Parish Boundary from neighbouring development pressuring 'us' to accept addtional development? How do BPC/NSC balance short term job creation via development vs long term environmental damage? How can we all work together? This must be a similar situation to North Somerset trying to protect its boundary and residents from neighbouring District Authorities and Central Government decision making e.g. the mandate to increase housing availability in North Somerset. 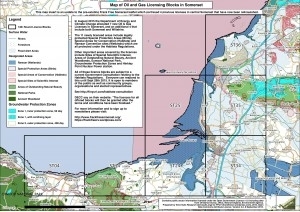 Also the fracking licences in both North Somerset (including the Bleadon Levels) and Somerset, presumably to supply the increased power demand due to increased development in the area (http://www.bleadon.org.uk/fracking.html). Hopefully any potential effects of fracking near our water supplies in the area has been/will also be seriously considered, jointly by all cross boundary parties, along with the need for increased water provision." "How is NSC/BPC protecting our environment, water and air quality, health and well-being from these types of application? How is it working with neighbouring parish/town/district councils/government and related public? How can 'we' build on recent hearing/inquiry knowledge, experience and general interest to enable the public to officially and successfully interact with the process?" There has been no repsonse to these questions to date, although BPC is now progressing a Neighbourhood Development Plan.and has sent an initial survey to residents (without a fracking question?). On 9 Dec 2016 Robin Whitlock wrote a letter to John Penrose MP regarding fracking. John Penrose MP responded on 22 Dec 2016. Robin Whitlock's reply on by other members of the public. On 19 Sept 2018 a member of the public received the following response from John Penrose MP. 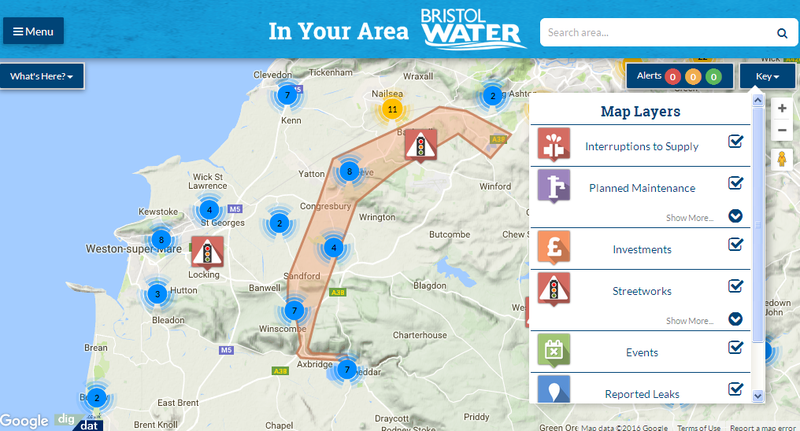 Bristol Water currently supplies the water in the North Somerset, Somerset and Bristol counties. Its Southern Resilience Scheme is a new £27 million water infrastructure project which "will help us meet the increase in demand for water over the coming years. Weston-Super-Mare is one of Europe’s fastest growing towns, and so we need to supply all of the new residents and businesses coming to the area". This map shows the extent of the project. To find if this is happening in your area enter your postcode and zoom out to see the associated information more clearly. You can also compare the extent of the fracking licences in the North Somerset area to local reservoirs here. Environment Agency works "to create better places for people and wildlife, and support sustainable development. Within England we’re responsible for: regulating major industry and waste, treatment of contaminated land, water quality and resources, fisheries, inland river, estuary and harbour navigations, conservation and ecology...." It offers environmental data and maps on a number of topics. You can choose a topic, enter your postcode and click on the map to read the associated information e.g. water abstraction from ground and surface water sources, drinking water safeguard zones, flood mapping, pollution and other topic areas, just choose the drop down menu to change options. UKRadon is the UK reference site on radon from Public Health England (PHE). As the UK's primary experts on radiation protection, PHE "represents a significant nationwide resource for the public, industry, education, research and medicine and is the primary resource for advice about radon in the UK. Radon is a natural radioactive gas, you can't see smell or taste it. In outside air the levels are low but it can accumulate inside buildings. Certain areas of the country are more prone than others." To check whether you are in a potential radon area enter your postcode at the UKRadon website, click show radon data and then click on the map to read the associated information. The Oil and Gas Authority state that their "role is to regulate, influence and promote the UK oil and gas industry in order to achieve our statutory principal objective of maximising the economic recovery of the UK’s oil and gas resources." 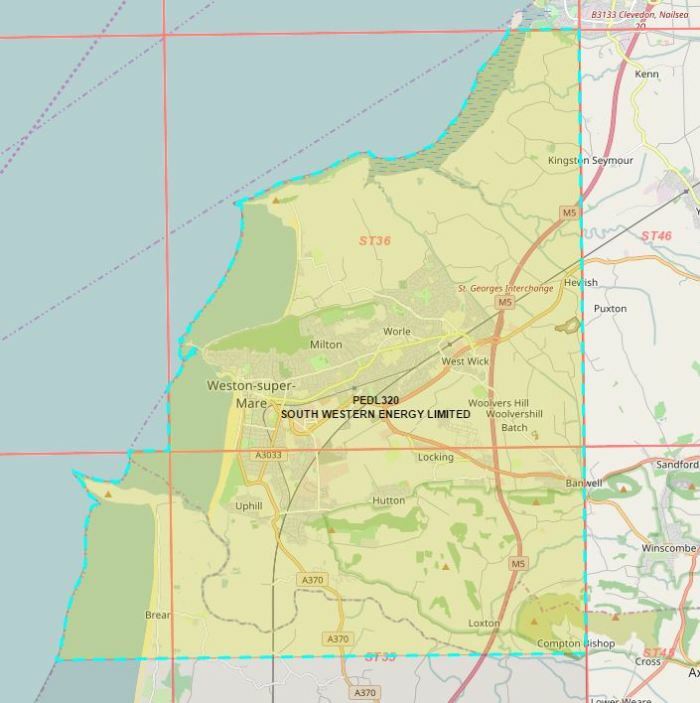 To check whether you are in a potential fracking area enter your postcode at the Oil & Gas Authority website, click on the map, then click the arrow keys to read the two pages of associated information. Bleadon's Petroleum Exploration and Development Licence is PEDL320. Neighbouring PEDLs include PEDL321 and PEDL344. 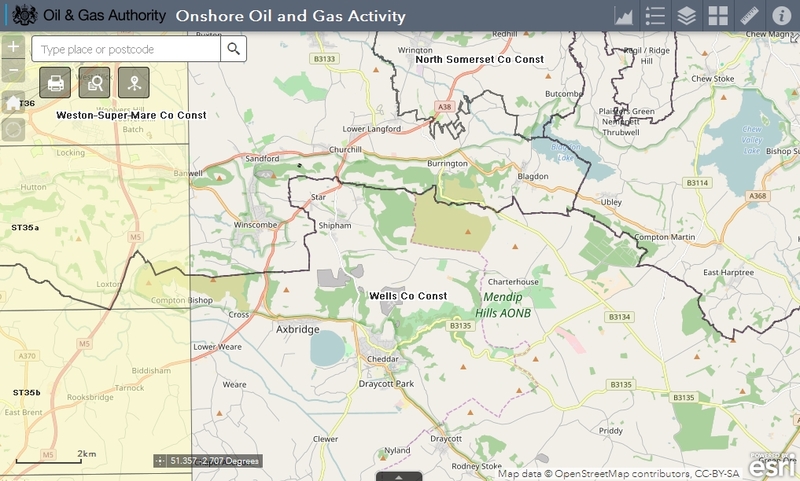 Other Oil and Gas Authority Interactive Maps & Documents. Past Government Oil & Gas Block Article informaton on new onshore oil and gas blocks to be offered, later withdrawn. Also, Guidance on Fracking, its consultation on the 14th Licencing Round with associated Licencing Map and Licencing Block Assessment Proformas. The Committee on Climate Change (the CCC) is an independent, statutory body established under the Climate Change Act 2008. Our purpose is to advise the UK Government and Devolved Administrations on emissions targets and report to Parliament on progress made in reducing greenhouse gas emissions and preparing for climate change"
This department brings together responsibilities for business, industrial strategy, science, innovation, energy, and climate change. BEIS is a ministerial department, supported by 47 agencies and public bodies. Its website hosts a Consultation Hub. UKOOG are the UK Onshore Oil & Gas and represent the Oil and Gas Industry. They indicate their vision of how a site looks, their Community Engagement Charter and proposed benefits. In 2015 The Scottish government has announced a block on planned fracking operations, pending further inquiries. Ministers will carry out new work on the environmental and health implications of the controversial gas drilling technique. In 2015 The Welsh Planning Minister Carl Sargeant earlier said he would be putting an immediate moratorium on fracking here - stopping any local planning authority approving any planning application for fracking. In 2011 France imposed a ban based on potential risks to the environment. In 2013 France's constitutional council rejected an attempt to overturn the ban. A 2014 indicates France's position at that time looking forward to 2016. Friends of the Earth International are "the world’s largest grassroots environmental network, uniting 75 national member groups and some 5,000 local activist groups on every continent. With over 2 million members and supporters around the world, we campaign on today’s most urgent environmental and social issues. We challenge the current model of economic and corporate globalization, and promote solutions that will help to create environmentally sustainable and socially just societies."